“We are proud the MF 6713 was nominated for this Award by the expert jury from 25 leading magazines from across Europe,” says Francesco Quaranta Vice President Sales, Marketing & Product Management Massey Ferguson EME. Innovative, straightforward design and modern features on the 130hp MF 6713 make it a dependable, easy to use tractor, which delivers uncompromising performance. This technology is complemented by a novel complete ownership package, offering exceptional value for money for a fully inclusive cost from just €28.50/day. 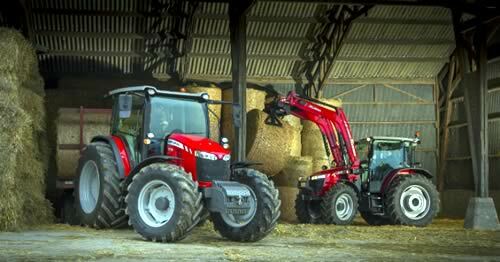 Key to the success of the MF 6713 is Massey Ferguson’s novel ‘complete package’ sales approach which offers a fixed and particularly low cost of ownership, including the MF Care extended warranty for five years or 2,500hr. For a typical MF 6713 customer this results in a net price from €28.50/day. By creating a package that brings together a competitive retail price and finance with a full manufacturer’s MF Care extended warranty, Massey Ferguson provides customers with total peace of mind. This means customers are able to get exactly what they need, at the right price and, importantly, they know the total cost for the entire period. A result of a $350 million investment to develop a completely new range, the MF 6713 is a product of the most modern design and engineering in the sector. With class-leading state-of-the-art, but straightforward technology in all areas, the MF 6713 combines performance and economy with ease of use. As a superb all-purpose tractor, the MF 6713 features a 2.5m wheelbase and 5.2t lift capacity and offers the most up-to-date cab, engine, transmission, rear axle and hydraulics in the sector. Operators are cossetted in a class-leading, air-conditioned cab. Designed and built in Massey Ferguson’s Beauvais facility, the spacious workplace offers high levels of comfort and control. Power is delivered by a 130hp AGCO POWER 4.4 litre, four cylinder engine, equipped with the award-winning ‘All in One’ system. This clever, compact system reduces emissions without compromising power or visibility and is completely maintenance free. Drive is transmitted via a completely new, highly efficient 12 x 12 gearbox, developed by Massey Ferguson specifically for the MF 6700 Series tractors. Meanwhile, the standard Power Shuttle offers clutchless direction changes. Ease of operation is further enhanced by the modern, ergonomic design, which provides high levels of control and automation. Electro-hydraulic activation of the differential lock and four-wheel drive, for example, automatically disengages and activates the systems when the brakes are applied and according to speed. The MF 6713 is the ideal loader tractor and is fully compatible with a wide choice of models from the Massey Ferguson range, which can be supplied factory-fitted and include dedicated a joystick control. Further enhancing performance is the optional 100 litre/min hydraulic system.